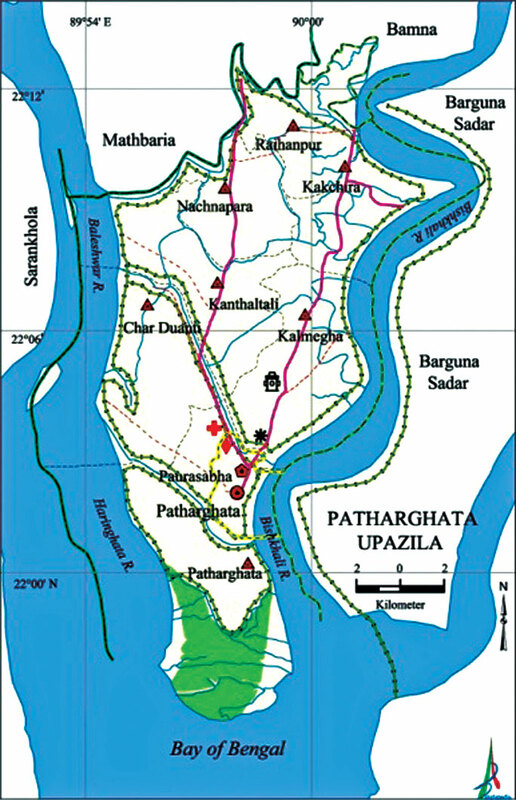 Patharghata Upazila (Barguna district) area 387.36 sq km, located in between 22°14’ and 22°58 north latitudes and in between 89°53’ and 90°05’ east longitudes. It is bounded by Mathbaria and Bamna upazilas on the north, bay of Bengal on the south, Barguna Sadar and the Bishkhali river on the east, Sarankhola upazila and the Haringhata river on the west. Population Total 162025; male 82687, female 79338; Muslim 143466, Hindu 18464, Buddhist 18, Christian 21 and others 56. Water bodies Main rivers: Bishkhali, Haringhata, Baleshwari. Religious institutions Mosque 443, temple 56. Literacy rate and educational institutions Average literacy 63.2%; male 63.9%, female 62.4%. Educational institutions: college 3, secondary school 24. Noted educational institution: Patharghata KM Secondary School (1929). Newspapers and periodicals Regular: Sangkalpa, defunct: Patharghata Barta. Cultural organisations Library 1, club 35, women organisation 7, cinema hall 5. Main sources of income Agriculture 60.3%, non-agricultural labourer 3.87%, industry 0.55%, commerce 15.88%, transport and communication 2.21%, service 6.42%, construction 1.46%, religious service 0.19%, rent and remittance 0.25% and others 8.87%. Main crops Paddy, potato, khesari, mug, vegetables. Extinct or nearly extinct crops Sweet potato, futi, water melon, sesame, tobacco. Main fruits Jackfruit, papaya, banana, pineapple, lemon. Fisheries, dairies and poultries Fishery 61, dairy 6, poultry 10. Extinct or nearly extinct traditional transport Palanquin. Noted manufactories Saw mill, rice mill, ice factory, welding factory. Cottage industries Goldsmith, blacksmith, embroidery, cane work, bamboo work. Hats, bazars and fairs Hats and bazars are 16, most noted of which are Patharghata Bazar, Kakchira Bazar, Rupdan Bazar, Haringhata Bazar, Char Duanti Bazar. Main exports Paddy, hilsha fish, shrimp. Access to electricity all the wards and unions of the upazila are under rural electrification net-work. However 5.43% of the dwelling households have access to electricity. Sources of drinking water Tube-well 81.34%, tap 15.76%, pond 1.75% and others 1.15%. Sanitation 47.64% (rural 44.02% and urban 67.63%) of dwelling households of the upazila use sanitary latrines and 46.66% (rural 49.82% and urban 29.24%) of dwelling households use non-sanitary latrines; 5.7% of households do not have latrine facilities.